Two baskets made by the Long Family. Although many baskets made in South Central Kentucky are made out of white oak, the Longs use willow and honeysuckle. This event has been rescheduled for Tuesday, August 4, at 7:30 p.m. Hope to see you there! Basketmaking is one of the most longstanding and vibrant traditional art forms in the Mammoth Cave region. Although most baskets in South Central Kentucky are made of white oak, other basketmaking traditions exist as well, such as willow and honeysuckle. 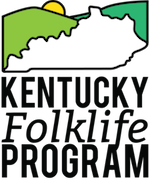 Join fieldworker Josh Chrysler and special guests Charles, Charlene, and Brandon Long at Mammoth Cave National Park on July 28 for a discussion of the willow and honeysuckle basketmaking traditions in their family. Topics of discussion include the utilitarian and artistic elements of the baskets and the role that basketmaking has played for the Longs. This free event will take place in the park amphitheater on Tuesday, July 28, at 7:30 PM. Contact Chrysler at chrysler.joshua@gmail.com for more information. Previous Previous post: Follow us!